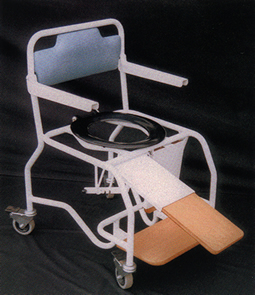 The Sanichair Commode is a heavy duty over toilet chair, which allows a patient to use toilet facilities in private. The over toilet chair has flip up arms for side transfer and lift up footboard. An optional loose upholstered seat cover and detachable bedpan fitting converts the Sanichair to a bedside commode. The optional multi positional leg rests are available for patients in need of lower limb elevation. The upholstered back is available in any colour you wish from the Just Colour range of Chieftain flame retardant vinyl.